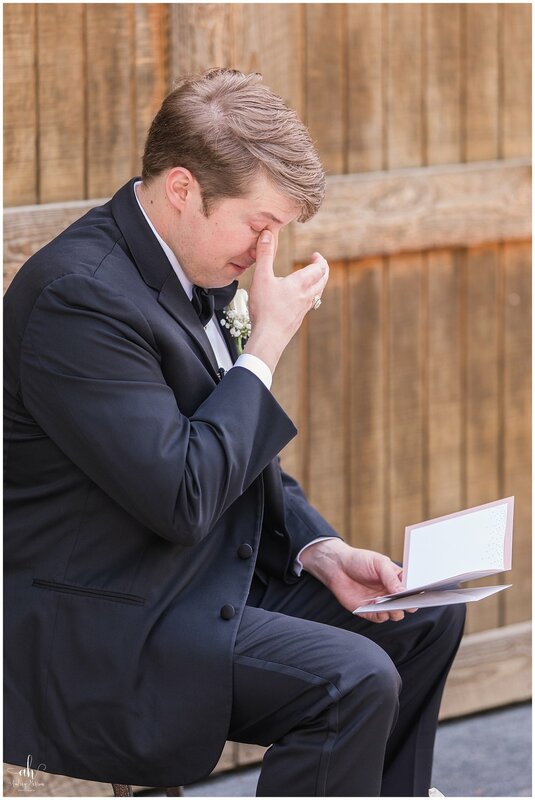 When I hear from a couple, usually it’s the bride who reaches out—but when I first got an email from Natalie and Alex, Alex was the one who sent it. That caught my attention and made me curious to know this couple! I invited them to come to the Duluth bridal show where I was a vendor so we could meet, and something just told me “that’s them” when I saw them walking up to my booth. I’ve been really blessed to have some amazing couples—and I knew right away they would be awesome to work with and a blessing to get to know. I loved hearing the story of how they met when we shot their engagement session in Gainesville. Natalie and Alex first met online, and arranged a date at a restaurant in Gainesville called the Monkey Barrel. When Natalie arrived early, she was shopping close by and noticed a guy walking by in a yellow shirt. She thought to herself, “Wow, I wish that was the guy I was meeting!” Little did she know it was Alex. Out of an abundance of caution, Natalie had given both her number as well as Alex’s number to her friend and Maid of Honor, Missy. When Natalie didn’t check in, Missy got worried and began calling Natalie. When Natalie didn’t answer, she called Alex. By the time Natalie and Alex parted ways, Natalie had 5 missed calls, 3 voicemails and multiple text messages. Fortunately, their date turned out pretty well, and I’m sure Missy forgave Natalie for worrying her. Two years later, Alex and Natalie were visiting Glacier National Park in Montana. Alex had originally planned to propose at Iceberg Lake, but had to revert to his plan B when that location was closed due to grizzly bears. His plan B involved a 12 mile round trip hike to Grinnell Glacier, and after making the location and getting his nerves up to propose, the words that came out of Alex’s mouth weren’t exactly what he had planned, and the next thing he knew, Natalie was excitedly agreeing to get another dog. Alex regrouped, was able to get the right words out the second time, and the two became engaged! April 6th was a cloudy but beautiful day out at In the Woods in Rockmart, Georgia. 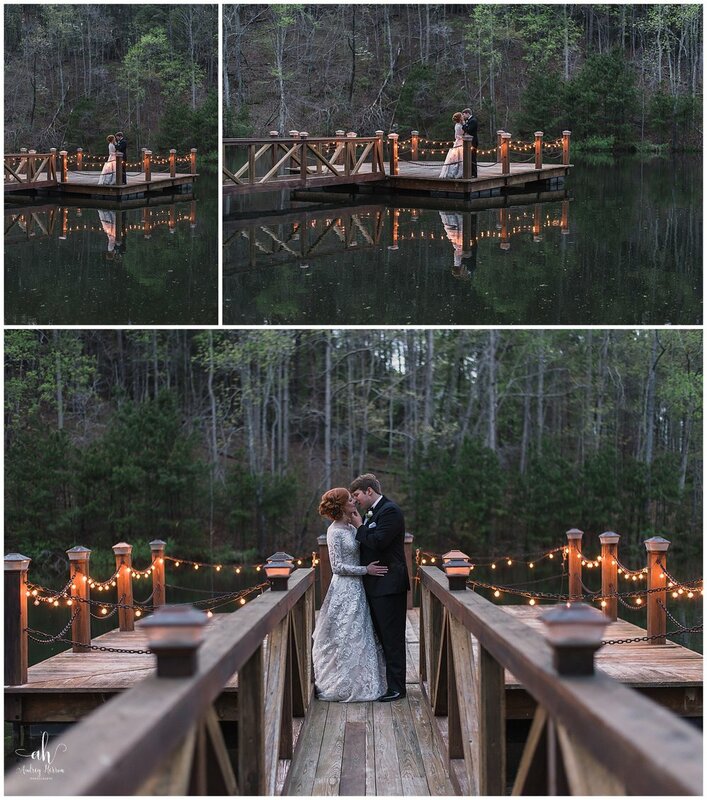 Knowing their love of the outdoors, it was easy to see why they chose this gorgeous venue as their wedding location. 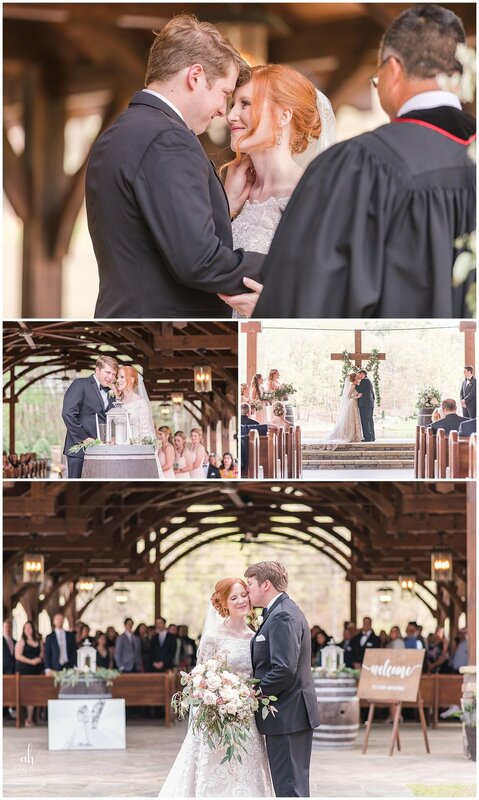 Curving paths led to the multiple locations throughout the property, and the ceremony was in a gorgeous arched and open chapel outside overlooking the lake. Y’all, if I haven’t already said it, Alex is a sentimental sweetheart. He teared up when he opened his gift from Natalie—a beautiful watch. He also had their initials, their wedding date, and the latitude/longitude locations from where they met, got engaged and their wedding location engraved on his cufflinks. After working with the guys, Kristal and I arrived back at the bridal cabin to find the girls intensely engaged in a card game. We pulled them outside to do some shots in their gorgeous, lace trimmed robes, and then it was time for Natalie to get dressed. Natalie’s maid of honor, Kathleen, described Natalie perfectly at her toast when she called her “poised”. Natalie is every inch the classic, poised, elegant, southern bride. Her gown was a classic, off the shoulder and long sleeved and her cathedral length lace trimmed veil was breathtaking. 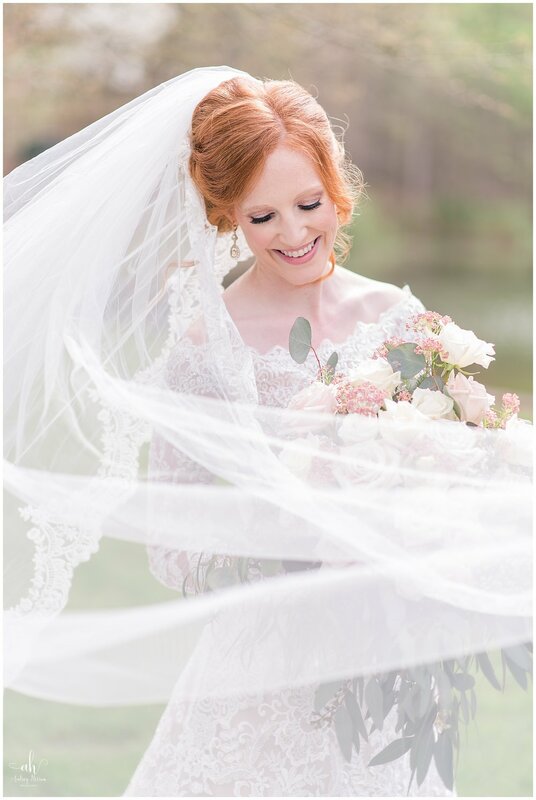 We were dealing with a little wind and some sun peeking out of the clouds every once in a while when we went out for Natalie’s bridal portraits…but when you have a cathedral length veil, wind can be your best friend! Finally, it was time for the ceremony. 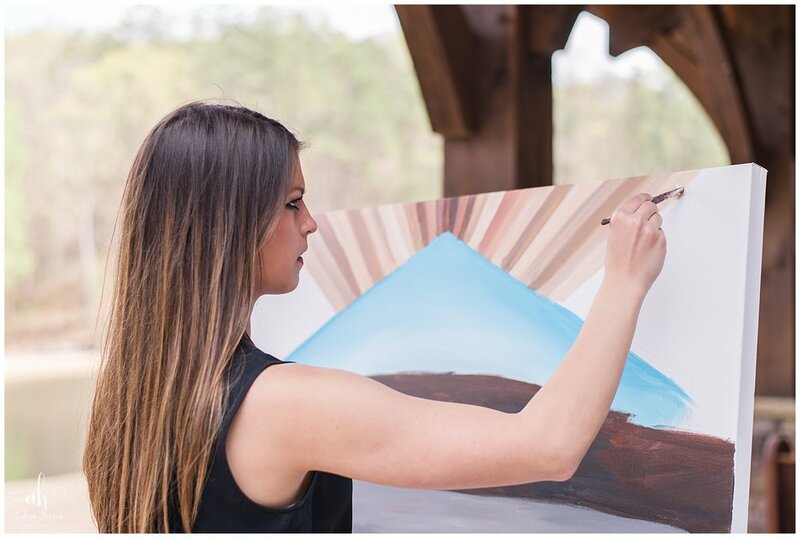 Natalie’s mom surprised her with live painter for the ceremony and reception. Caroline Stroud was already set up and working on her background when Kristal and I arrived to grab some detailed shots before the ceremony. 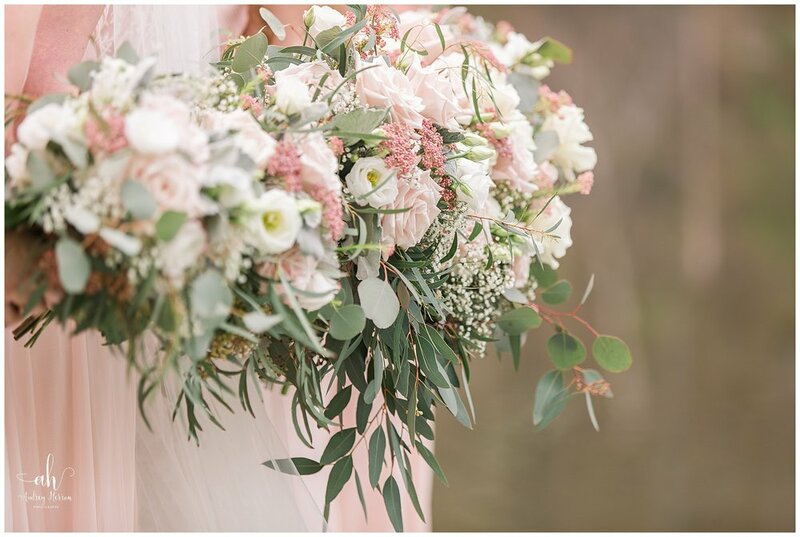 The cross at the alter was draped in a garland of blush roses and eucalyptus, and wreaths of the same flowers covered the tops of the barrels at the entrance of the aisle. 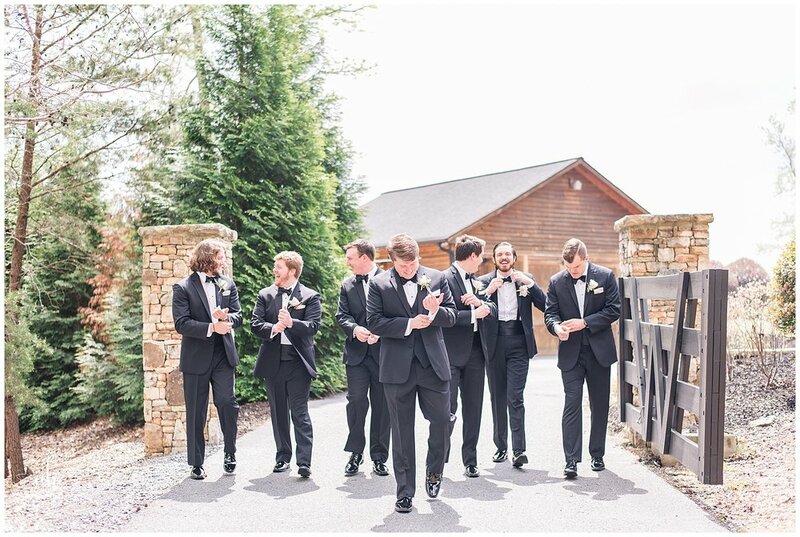 When the gates opened and Natalie and her father began to walk through, Alex was overcome with emotion as he watched his beautiful bride walk toward him. Their ceremony included a unity candle, and personal vows they wrote for one another. They were pronounced man and wife and were all smiles as they exited the chapel. At the reception, Alex had a cake that resembled a football field with the Clemson football helmet on it. 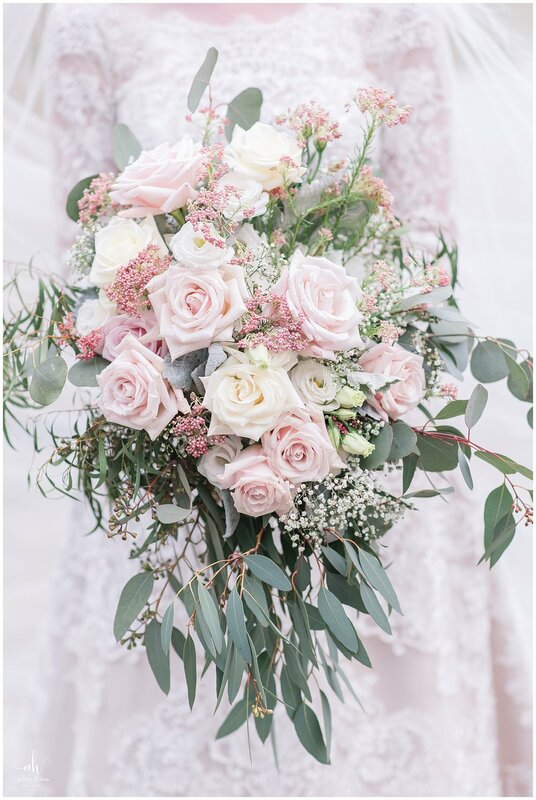 The tables were decorated in bouquets of white and blush pink flowers, and an amazing spread of southern staples lined the buffet. Alex and Natalie shared their first dance followed by first dances with Alex’s mom and Natalie’s dad. After dinner, we whisked them back out to the dock to grab some stunning night images of them with the outdoor lights that lined the rails. When we returned, the toasts were given, the cake cut, and the dancing was followed by a sparkler send off. I can’t say enough about how sweet and special this couple is—I have had an amazing and blessed experience getting to work with them and capture these special moments for them! Alex and Natalie, I can’t thank you enough for allowing me to be part of this chapter in your lives. I pray that God blesses your marriage, and I wish you days filled with laugher, joy and love.